I started hiking up the trail at 6:45 am, eventually hitting continuous snow near the Timberline CG junction at 6200 ft. The snow was still frozen solid, so I kept hiking in the boot track until 8000 ft, just above Crescent Glacier. I switched to skins and ski crampons, and skinned up to 10800 on slightly softening snow, then put the skis back on the pack and cramponed on foot up the last pitch to the false summit by 12:30. Only a few other parties were around, 3 skiers about to start back down the South Rib and maybe 10 climbers glissading. The South Rib is moderately suncupped and runneled, but still looked OK for skiing. The traverse across to the summit went quickly on frozen snow, followed by softening deep suncups on the south side of the summit block, and I reached the top around 1:30 pm. I skied down at 2 pm, staying on the SW face of the summit block well west of the climbing route. The snow here had softened nicely, and was smooth compared to the suncupped route up. But the sweetest snow of the day was found on the upper part of the SW Chutes. From 11500 down to 10000 ft, the snow was almost perfectly smooth and really exceptional corn, the nicest ski run I've had yet this year. 2 pm was the perfect descent time on this day. The snow remained fairly nice all the way down to the first flats at 8000 ft, becoming heavy and somewhat ash-covered in the bowls down to 7000 ft. Lots of rocks were coming down the cliffs to skier's left, but none near the ski route. 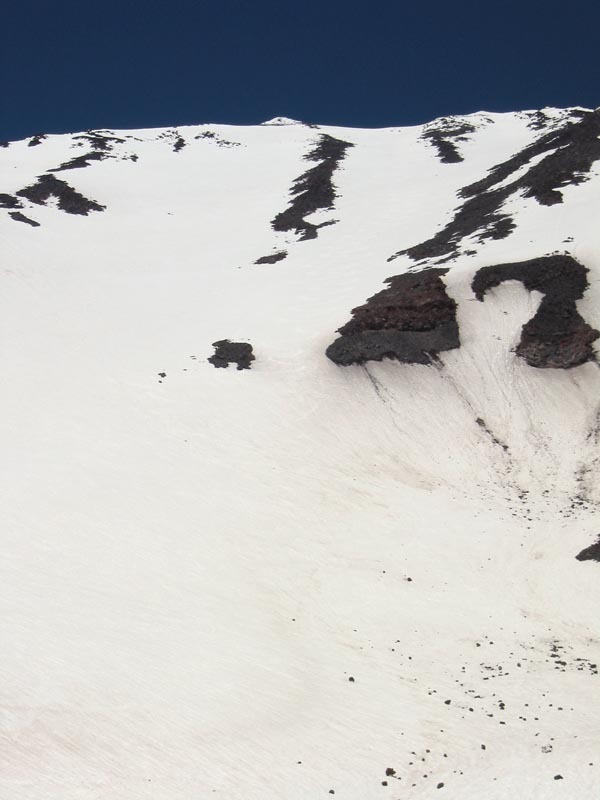 The traversing exit route from the last bowl is melted out (reports from a week earlier said it still went, and I could see numerous ski tracks now ending in rock bands). After getting cliffed out near 6800 ft while attempting the traverse, I turned around and skied down the obvious main stream gully, which joins the Round the Mountain Trail at 6050 ft. With two short carries, I skied down to below 6200 ft, and then hiked the heavily eroded climber's path down to the trail. The RTM trail is still 80% snow-covered and sometimes hard to follow, and the long up-and-down hike back to the South Climb Trail took nearly an hour, followed by a quick jaunt down to the car. Wow, what a day, 6100 vertical feet of good-to-exceptional skiing in July! This photo taken from 8000 ft shows my single solitary ski track in the SW Chutes (sorry, it's somewhat faint in the photo, see the enlargement). The few other skiers that day all chose the South Rib, missing out on an exceptional descent on fantastic snow. oh good! the other report of the south side suncups had me worried! thanks Amar.